This is a screen shot I took while looking for schools of Stripers. It was taken off of a HDS12. 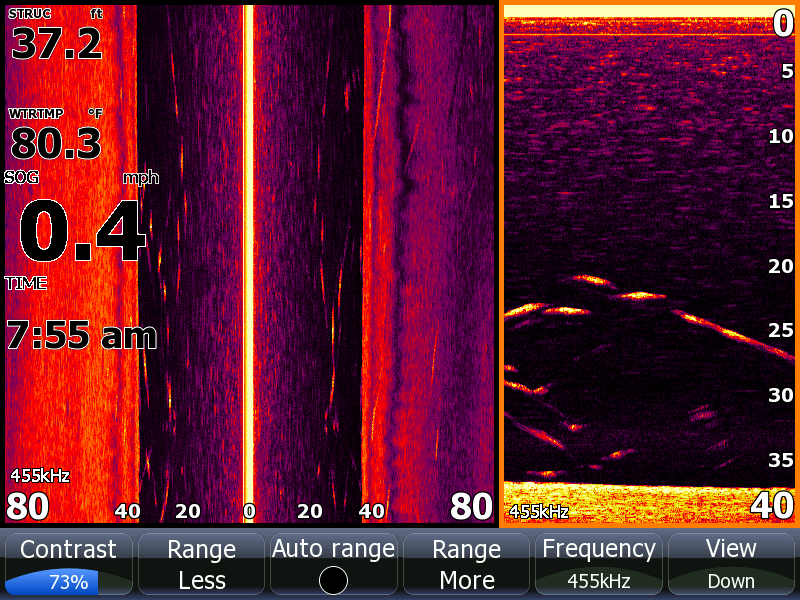 In the top sonar screen on the left I was running about 22 mph and noticed some Stripers [red inverted v's] 30 to 40 feet deep. The black vertical dashes are motor noise [I keep my sensitivity high when running]. About a quarter way through the screen I slow down to check it out and you can see the disturbance of the boat stopping near the surface. At the same time the arches near the bottom get larger and larger due to boat speed slowing which helps identify the Stripers. 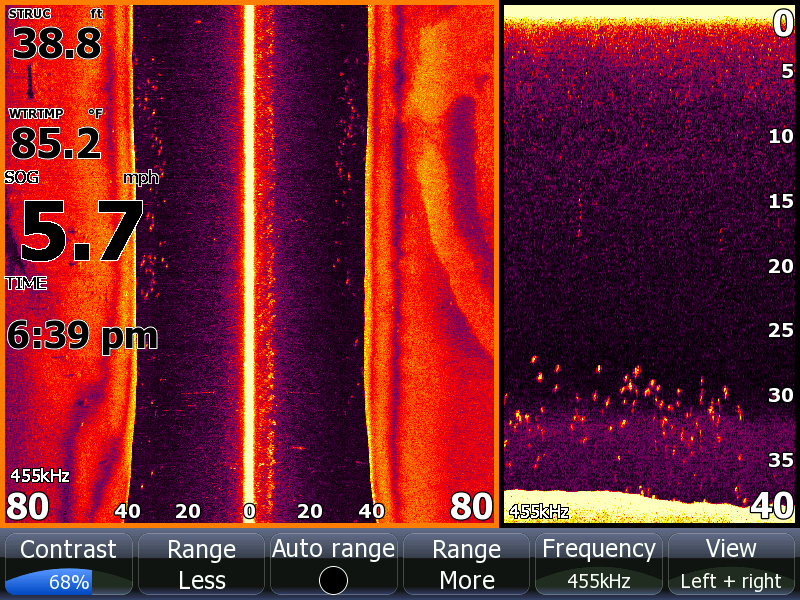 Also as I slowed down you can see much less motor noise on the screen. 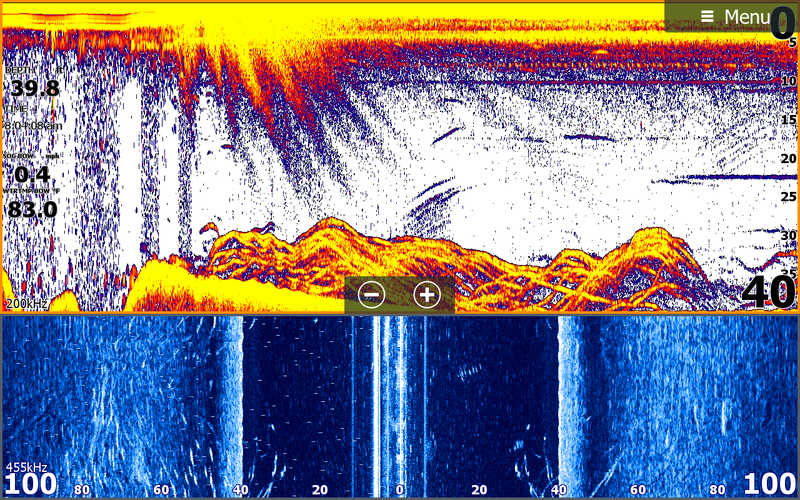 On the bottom side scan screen all of the vertical white dashed are Stripers with more fish 50 to 85 feet out to the left side of the boat. I turned the boat to the direction of the school, deployed downlines at 32 feet deep and every rod hooked up. This is a screen shot from DP's HDS 8. 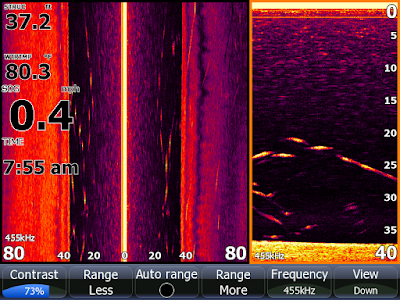 The left side of the shot is side scan showing Stripers as the vertical dashes and the right side of the screen is down scan showing Stripers as well. 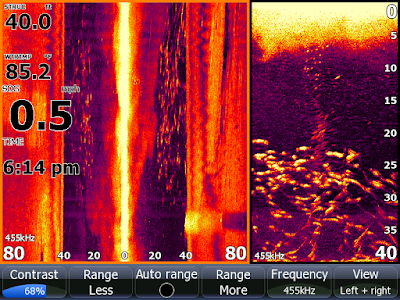 This again is a HDS 8 pic of a major school of Stripers on side and down scan. Each individual mark is a Striper. Yea, they limited out pretty quick here. This pic was taken a few minutes later as they were loosing the school. DP turned the boat back around and took this shot below on a straight sonar screen. They are hooked up here fighting 3 fish to the surface. I post these screen shots to help anglers who have Navico products learn to interpret what they are seeing on their units and how to use their units to find fish. If you are not seeing on your units what I show in these shots you can email me and I can help dial you in. 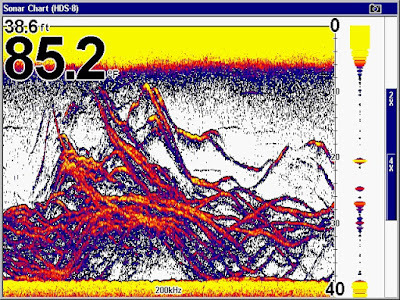 If you don't have a Lowrance or a Simrad, better get down to Greentop Sporting Goods and get you some, you are spending more time fishing than catching. 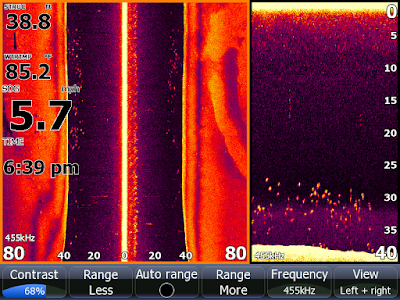 The most common cause if anglers aren't seeing pics on their units like I post is transducer installation. If you can't see the bottom and distinguish objects at full throttle on your boat, most likely the transducer is mounted incorrectly. It may be too high, behind a chine, wrong angle to the water, etc. If you can read clearly at high speeds then your settings may be off or maybe you did not mate your unit to your transducer which should have been done in your initial set up. Your unit needs to know what it is looking through so it can interpret it correctly on the screen. If you need help using a depth finder and locating and catching Stripers you may want to book a charter to get some on the water experience. My email address is Jim_Hemby@hotmail.com .